13 what birds are these? I tried a lot of sites and I couldn't get the right birds!!! oh, and please identify them asap! I need them for my science! Your picture has not loaded correctly and can't be viewed to help with your request. Two photos have been retrieved from the website and appear to have been uploaded by yourself, so I have added them to your post. 13 hey, just wanted to tell you, my uncle told me the yellow-ish one might be a wild canary, but even HE'S not sure about that (emphasis on the word MIGHT). 13 The top pic is actually a finch of some sort, most likely a young finch, but I can't tell and/or find the species. 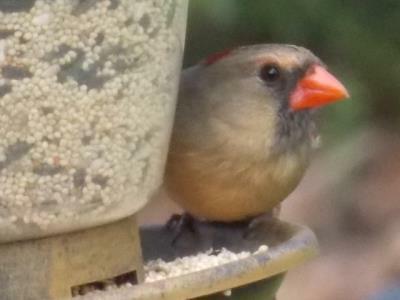 160 After much deliberating I believe the bird in the top picture is actually a Cardinal (flattened red cap on head, grey facial feathers and the red beak). 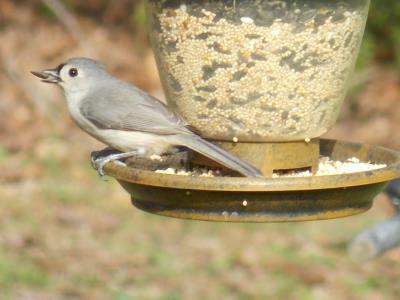 The bird in the lower picture is a Tufted Titmouse. thank you so much! my mom helped me with the cardinal because a pic showed it with a male cardinal, but thank you for the titmouse! I never would have guessed that! and, thanks for the fast reply! you're awesome! heck, I even guessed a pigeon!